Celebrate the end of summer with our two favorite land trust picnics! Steep Rock Association and Weantinoge Heritage Land Trust invite you to join them for their Annual Family Picnic and Fall Celebration! On Saturday September 10, Steep Rock Association is hosting their annual family picnic from noon until 2 p.m. There will be complimentary programs, hamburgers, hotdogs, fixings, lemonade, and cookies! The picnic will take place at the Steep Rock Preserve in Washington Depot. 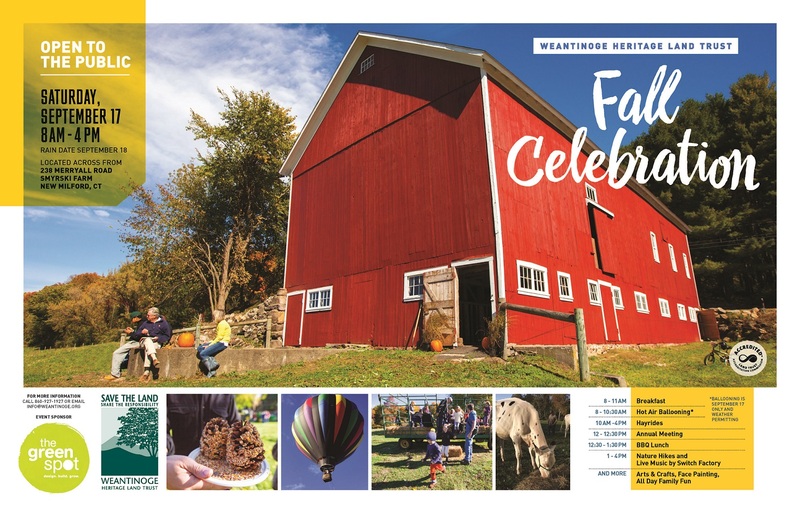 On Saturday September 17, Weantinoge Heritage Land Trust is having their Fall Celebration from 8 a.m. until 4 p.m. The program includes breakfast, hot air ballooning (weather permitting), hayrides, annual meeting, BBQ lunch, nature hikes, live music by Switch Factory, face painting, and arts & crafts. Located across from Smyrski Farm: 238 Merryall Road, New Milford CT.